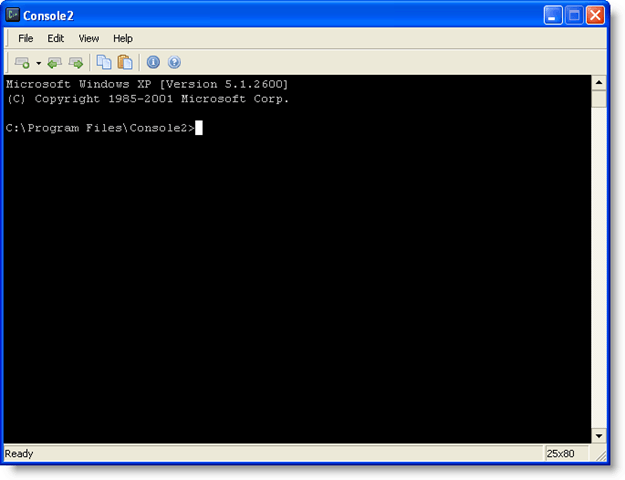 Previously, we have written about customizing the Windows command prompt. 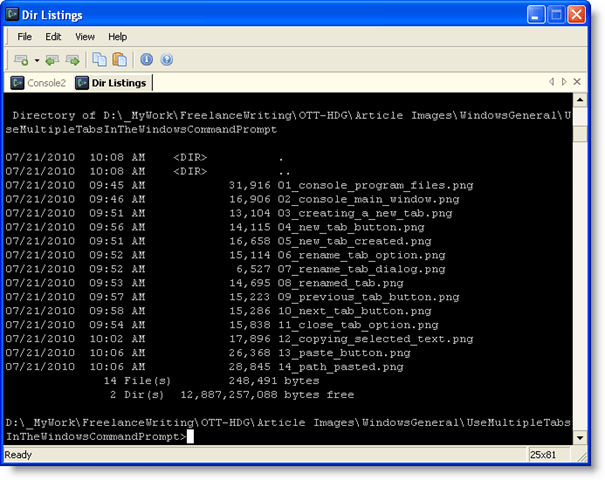 There are several ways to customize the look and behavior of the Command Prompt. However, we have found a freeware utility, called Console, that allows multiple new Command Prompts to be opened under new tabs instead of running as separate windows. This prevents too many Command Prompt windows taking up room on your Taskbar. 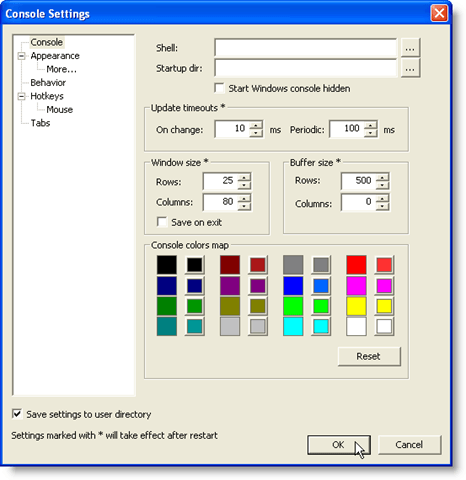 Customizing font color, changing the cursor to different styles, setting how many rows are scrolled at a time when using the scrollbar, are among the many other handy features of Console. NOTE: Console is NOT a shell. Therefore, it does not implement shell features like command-line completion, syntax coloring, command history, etc. Console is simply a nice-looking, handy front end for a shell of your choice (cmd.exe, 4NT, bash, etc.) Other command-line utilities can also be used as ‘shells’ by Console. Console is portable and doesn’t require any installation. It can be run from any drive such as a USB drive. It runs on Windows 2000 and newer versions of Windows. Even though it hasn’t been updated in many years, it still works fine. I tested it in Windows 10 and it worked great! 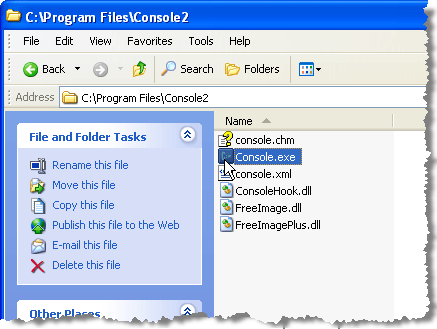 To start Console, double-click on the Console.exe file. 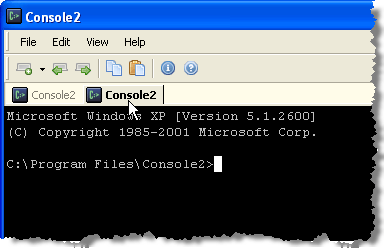 Console opens displaying a Command Prompt. 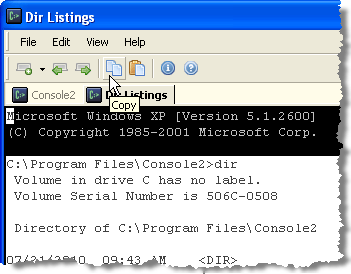 You are initially in the same directory as the Console program. 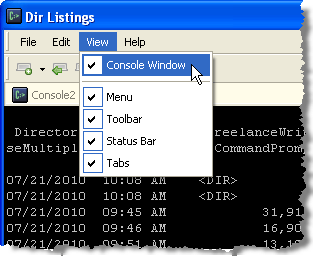 Console allows you to create tabs to have multiple Command Prompts open. 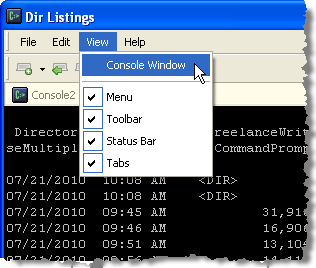 To create a new tab, select New Tab | Console2 from the File menu. You can also click the New tab button on the toolbar to create a new tab. 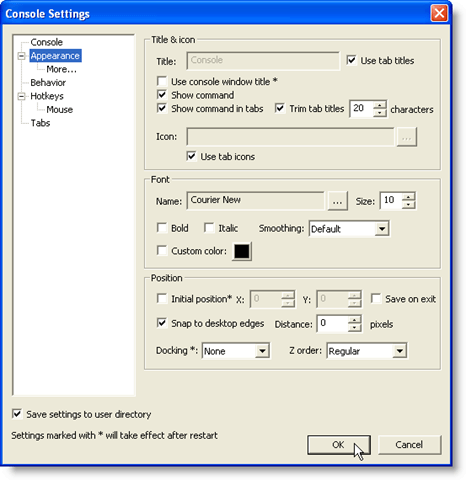 A new tab is created and is named Console2 by default. The name given to new tabs can be changed in the settings. We will discuss the settings later in this post. 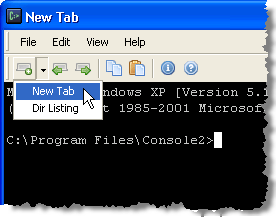 To rename a tab, click the tab you want to rename and select Rename Tab from the Edit menu. 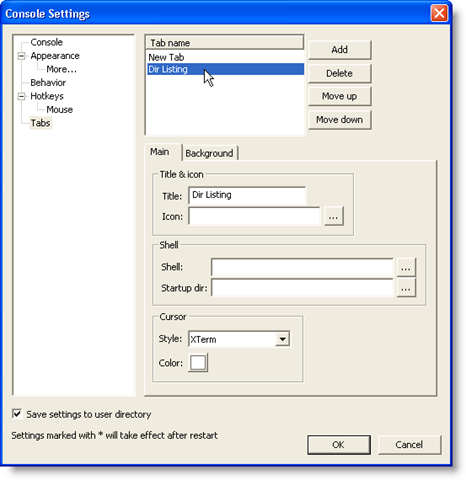 The Rename Tab dialog box displays. Enter a new name in the New tab name edit box and click OK. The name on the active tab changes to your custom text. You can change to a different tab by clicking on the desired tab. If you want to move through the tabs to the left towards the first tab, click the Previous tab button. Each time you click the Previous tab button, the next tab back to the left of the current tab is activated. To move through the tabs to the right one at a time, use the Next tab button. To close the currently active tab, select Close Tab from the File menu. Console allows you to copy text from and into the Console window. 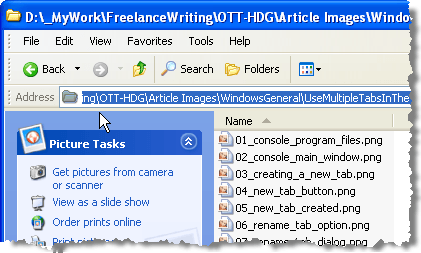 To select text in the Console window, press and hold down the Shift key and highlight the desired text to be copied. Click the Copy button on the toolbar. You can also copy text by selecting Copy from the Edit menu. 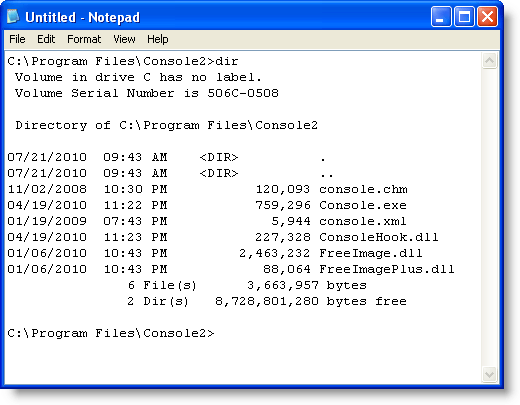 Text copied from the Console window can be pasted into any text editor or word processor. You can also copy text from outside Console and paste it at the Command Prompt. This is useful if you have a long path to which you want to switch in the Console window. Copy the path in Explorer from the Address bar. Go back to Console and click the desired tab, as applicable. 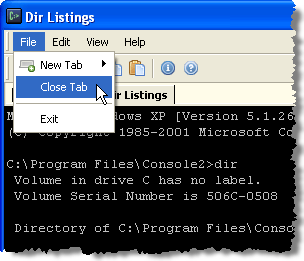 To change to a different directory, like we are in this example, type cd and a space. 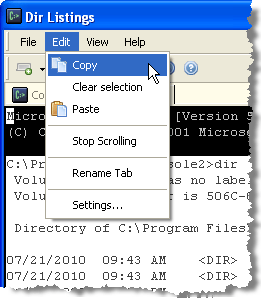 Then, click the Paste button to paste the copied path after cd. You can also select Paste from the Edit menu. NOTE: If the desired directory is on a different hard drive, switch to that hard drive first by typing d:, for example. Press Enter to switch to the desired directory. 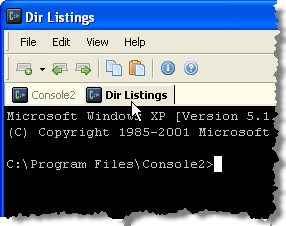 You may then issue the dir command in the new directory. There are many settings you can customize in Console. To access the settings, select Settings form the Edit menu. 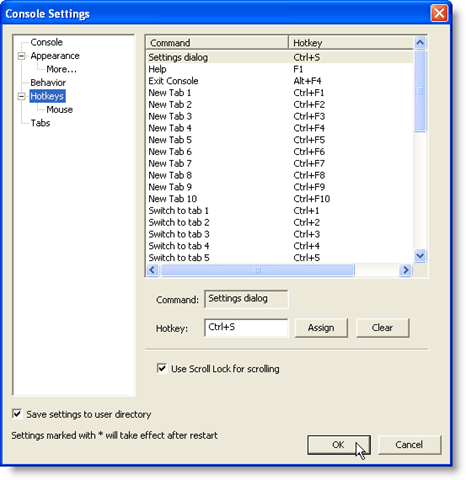 The Console Settings dialog box displays with the Console screen active. Use the Shell edit box to specify the default shell command line and the Startup dir edit box to specify the default initial directory for shells. Use the browse (…) buttons next to these edit boxes to find and select the file/folder. NOTE: If the Shell edit box is left empty, Console uses the COMSPEC environment variable, which contains the path to cmd.exe, as the default shell. 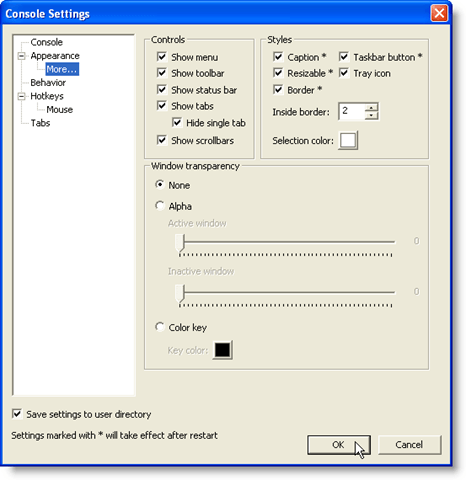 The Console screen also allows you to specify the Window size, Buffer size, and the Console colors. Click the Appearance item in the tree on the left side of the Console Settings dialog box. Use the Appearance screen to change the name in the title bar of Console in the Title & icon box, change the icons used on the tabs, change the Font and the color of the text in the Console window, and change the Position of the Console window. For more Appearance settings, click the More… item under Appearance in the tree on the left. You can choose which Controls to show, the Styles for the Console window including the color to be used when selecting text, and the Window transparency. 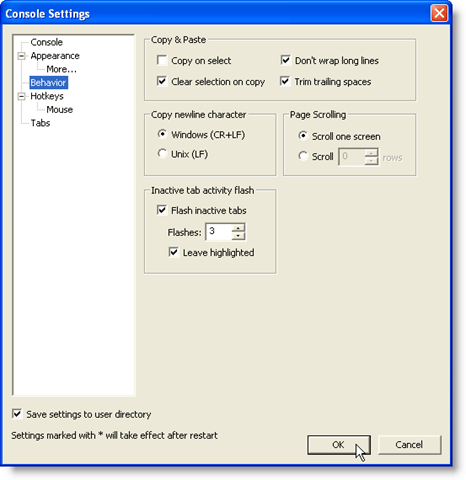 Click the Behavior item on the left to change settings for the Copy & Paste, Copy newline character, Page Scrolling, and Inactive tab activity flash. 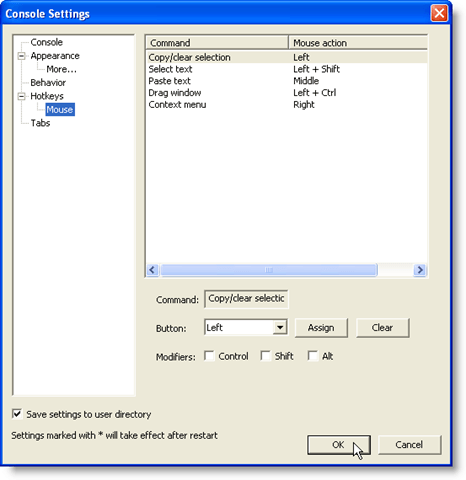 Console provides you with numerous hotkeys to quickly perform actions. They are listed on the Hotkeys screen on the Console Settings dialog box. You can change these if desired. To do so, select the hotkey you want to change in the list and enter the new hotkey in the Hotkey edit box by putting the cursor in the Hotkey edit box and typing the key combination. Click the Assign button to accept your change. If you want to remove a hotkey and not replace it with a new one, use the Clear button once you have selected the desired hotkey. The Mouse screen allows you to change the mouse buttons used for performing the listed commands. You can also change the keys (Control, Shift, Alt) that are used with the mouse buttons for the commands. Use the Assign button to accept a change to a command and the Clear button to assign no mouse action to a command. The Tabs screen allows you to specify the default name used when creating a new tab. 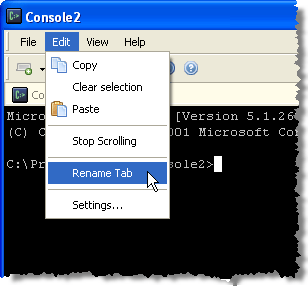 This name is initially “Console2.” To change this, select Console2 in the Tab name list, and change the value in the Title edit box on the Main tab below the list of Tab names. You can also add additional tab types using the Add button and the Title edit box to rename them. 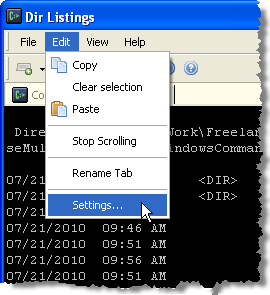 This allows you to create a new tab using a different shell you specify in the Shell box on the Tabs screen. 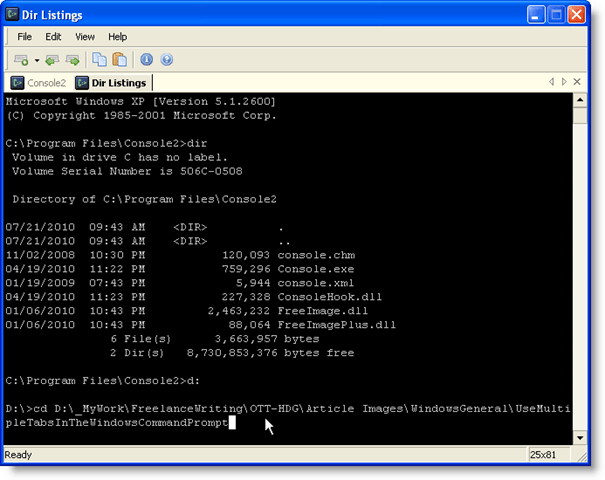 Console allows you to see the actual Command Prompt window, or Console Window, which is initially hidden. 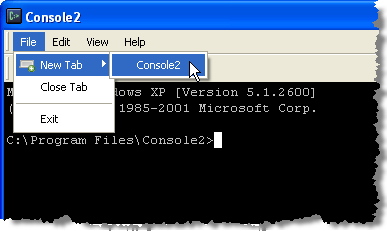 To view the Command Prompt window, select Console Window from the View menu. To hide the Command Prompt window, select Console Window again so there is no check mark beside the option on the menu. 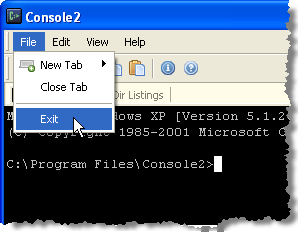 To close Console, select Exit from the File menu. Console is a useful freeware utility if you use the command line often. It helps you keep your Taskbar uncluttered by providing you with tabbed command prompt windows and provides convenience with many customizable hotkeys copying and pasting text, opening new tabs, etc. Windows 7 Devices and Printers Hangs or Won’t Open?